And here is what it looks like open! Since Michael is a graphic arts major, he is designing the inside with a fun poem I gave him and the details of the open house. I found this idea on youtube and just ran with it. I just love this idea, and surprisingly, Michael likes it too! I am not yet happy with the tassel, that is going to need a few more prototypes. I didnt really want to use a larger brad and the string just comes out from around the brad too much. Any suggestions or ideas would be greatly appreciated, or if you just had fun looking, thanks for stopping by!! p.s. yes I know my post says Tuesday, but it's Wednesday where Julia lives and almost Wednesday here lol! Close enough and my desk won't change between now and a few hours from now as I am going to bed! This is my second attempt, the first one I didnt even finish, just didnt like where it was going. Jump on over to http://www.cookingwithcricut.com/ for another great Challenge! My card uses the Cricut Imagine Yummy cartridge. A2 card base from DCWV. That's it! One great thing in using the Imagine is you actually will use less paper and supplies and can make a quick card at any time. Here is today's workspace. Started a project working on college graduation announcements for my SO, Michael. You can see parts of them in the bin there. Trying out some techniques, trying to decide how I want to decorate them. Finally figured out the design that I want to do, now to just get 35 of them made by the end of March, should be easy enough to do. Since Michael is a graphic design student, I asked him to design the printed inside, so it can be all graphic-like and all lol. I am still waiting on my son to make me another shelf, my stamps are on top of one another (outside of photo range) and are getting annoying. Been in a crafty funk lately. Trying to do some new cards and when I see what others have done and what I came up with I just want to trash mine! Well, this one stumped me. I am not really sure what they want for this challenge. I read this and then looked at the example and it just didn't jive. Therefore, I will interpret it my own way and go from there. The Challenge: Scrap what you love! 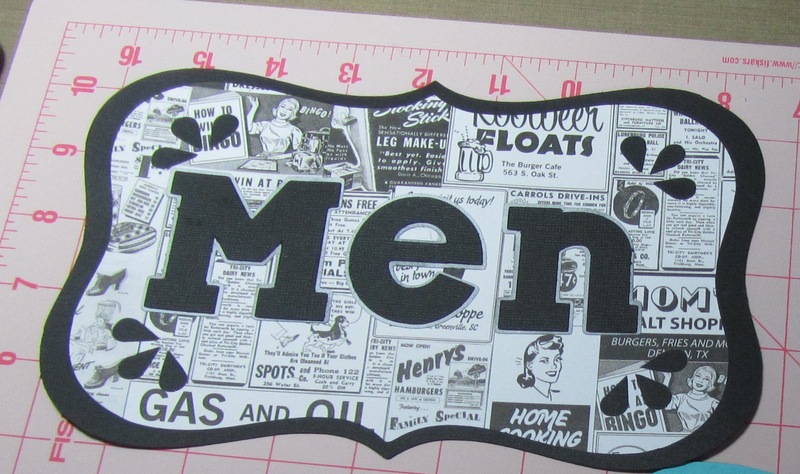 Include a tag and use the negative space of a Cricut cut. My interpretation is to take a large tag, one with spaces or cuts in it, and to use the negative space for the background to show through. This isnt exactly scrapping what I love directly, but indirectly. I love sushi. There is this wonderful little mom and pop sushi place we frequent 1-2 times a month. They have typing paper taped on the bathrooms for the sign, so I made them signs :) So you see, I did scrap something for something I love hehehehe. Tag shape is from CTMH Art Philosophy and the letters are from Birthday Bash. 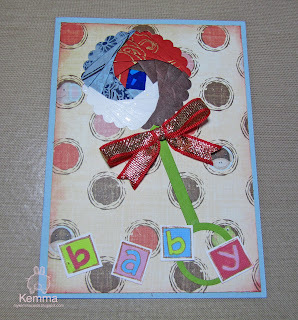 Made this fun little card with RRR ribbon, scraps from my scrap bin, and a new stamp and inks I got from Papertrey Ink. Hello again from Indiana-better late than never~! Lots of folks liked my new tower for paper last week and I wanted to share where I got it. I got it from http://cameronstoyz.com/ and just love it. I now have it filled with paper! Here is what we have on the desk today. Got some new stamps and got them all into cases and stamped into my stamp album. I had sort of sorted them but that categorization isn't really working really well, the "uncategorized" seems to be taking up half the book. Hmm, I need to clean up the desk some. I have ran out of space on my shelf that I was putting the rubber stamps, and need to add another one. There is the start of a new project under the stamp album. 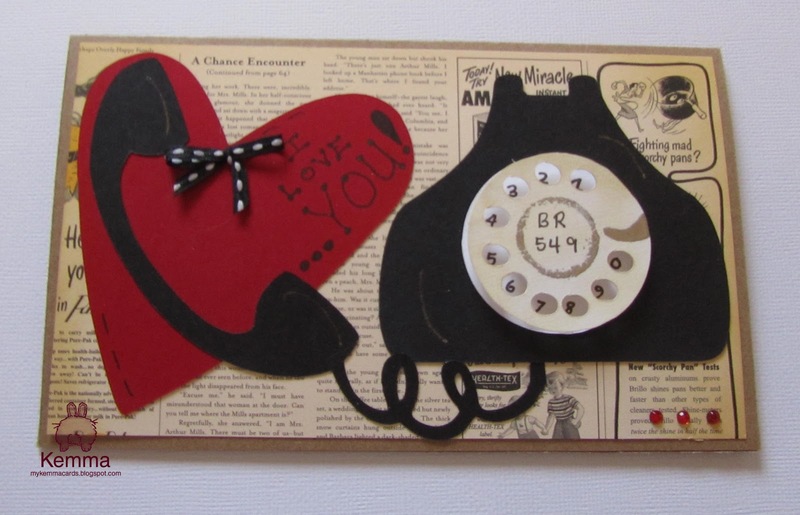 Weekly Challenge #51: Valentine’s Day Cards Challenge! 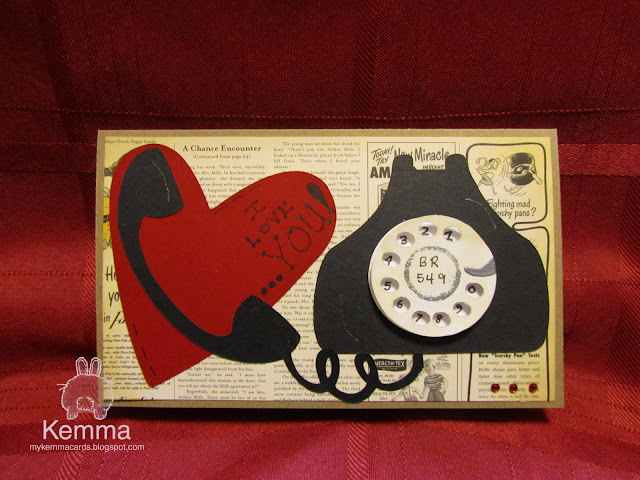 The Challenge: Create a Valentine’s Day Card. 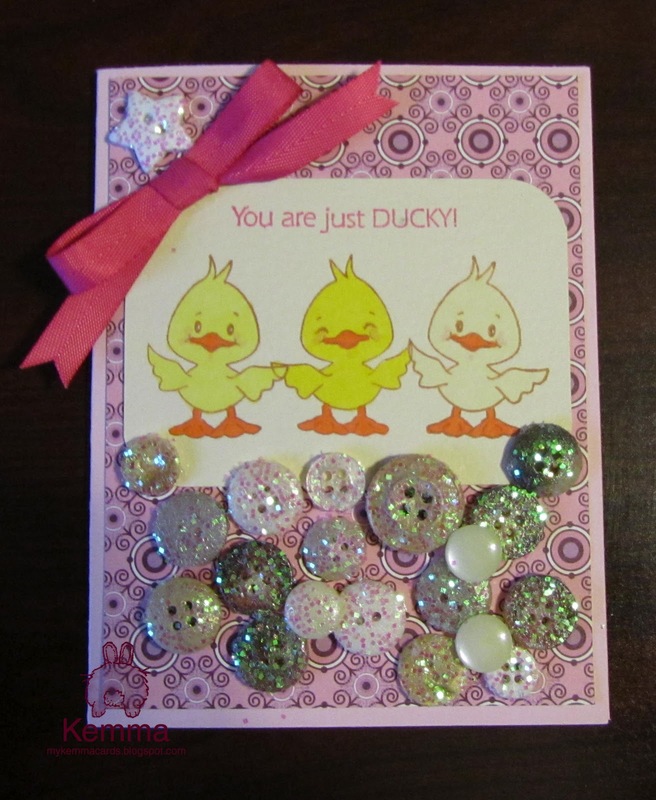 Include sequins or gems and ribbon. I just love how this card turned out. I created it for the Cooking with Cricut Blog hop this past weekend and it truly inspired me. I decided to add a little bow to it to qualify for this challenge. I am not sure if I like it better with or without the bow. It was created during the window of the challenge so it should be good for posting. This one is going in the SMASH book! Welcome to PaperCraftingWorld.com & CookingWithCricut.com's Love Song Blog Hop! Love is in the air and our Designers have come up with some great Valentine's Day projects inspired by their favorite love songs. I am so glad you stopped by! This is my first blog hop and I am SO excited to share with you today. If you arrived here from visiting Jenny J. 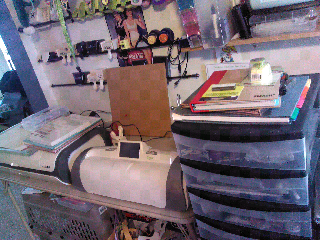 @ Crazy About Cricut you're in the right place. 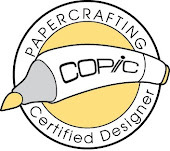 If you're joining us mid-hop and would like to start at the beginning click here to go to Paper Crafting World’s Cooking With Cricut blog to start from the beginning! I was inspired by a famous love song, can you guess what it is? Keep reading to find out! Song name and artist revealed at the end so keep reading! I had to make the Chance Encounter a focal point too :) What fun! So....have you guessed the song yet? Keep reading! 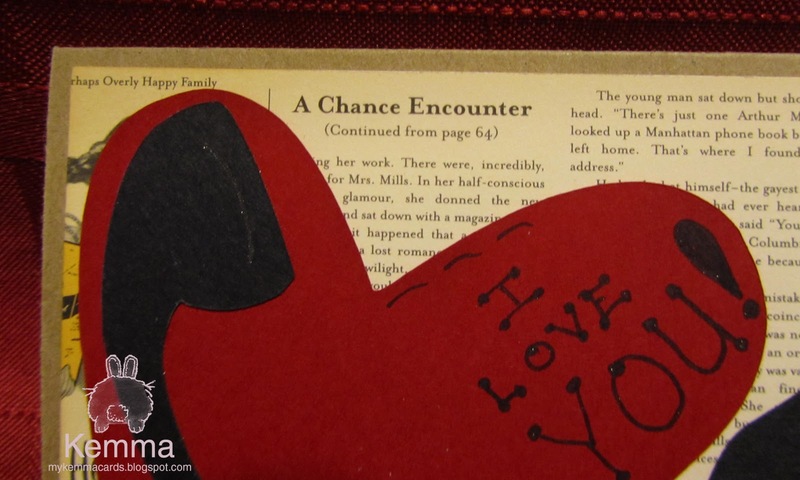 We hope you’ll join us and link up your favorite love song inspired project at CookingWithCricut.com. One lucky entry will be chosen by random.org to win a $10.00 gift certificate provided by PaperCraftingWorld.com! And make sure you leave a comment, too! AND just for visitors of my blog, I have to give away a little bit of blog candy since this is my first! In order to win these sweet little folding Fiskars scissors, which are great to take places like crops and classes or to keep in your purse. You must be a follower of my blog and leave me a comment below by noon EST on 2/14/2012 for your chance to win. Be sure to leave me your email address. If I do not have a way to contact you I will chose another winner. You will have a week to claim your prize. Well, we are almost to the end, did you guess the song? Thanks so much for hopping with us today. 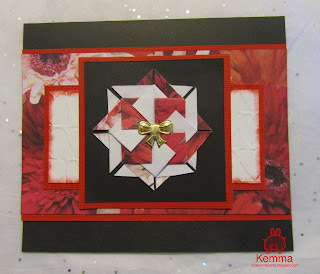 Now head on over and visit Madison @ Funky Cards and see what she has created! Trying a post from my tablet today. This week has been really busy. I got a new paper tower, see previous post. So with getting that I had to rearrange my area. I can't get the whole wall in one photo so I will take a few more here. 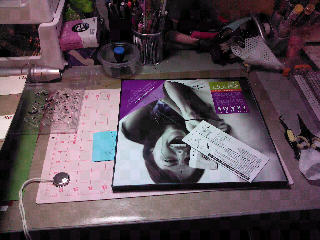 What I am working on is a menu board. I broke the glass as you can see there just opening the frame so I think its defective and need to exchange it. I will blog about it when it is finished. I also have a few birthdays coming up that I have started collecting the stuff for. 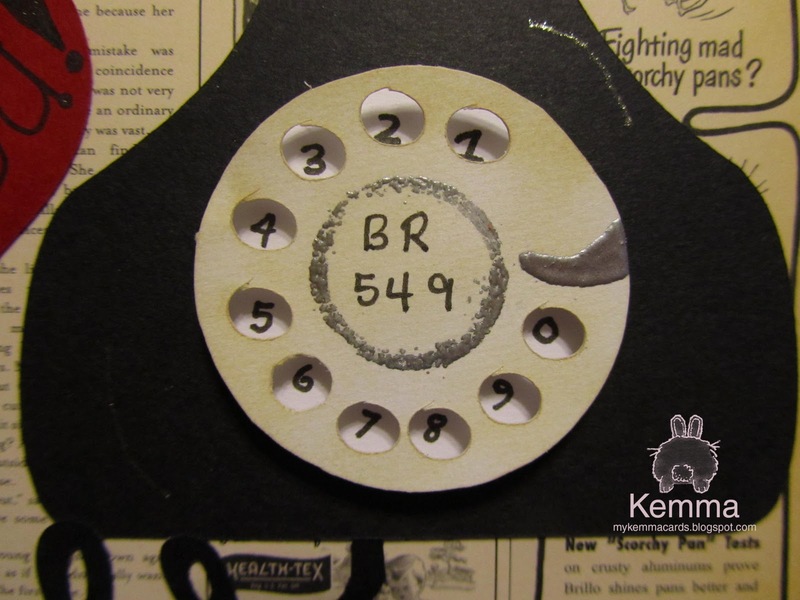 Am hoping to get those done this week and to sort my patterened paper into the paper tower. 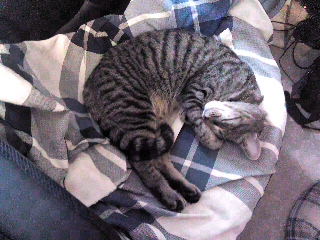 I also have something occupying my chair lol. ANOTHER GREAT COOKING WITH CRICUT CHALLENGE!! You must use a brad and the color black on your project. This challenge is hosted by three Cooking with Cricut Design Team members: Kemma (that's me! ), Dalis and Michelle !! I was inspired to do something different for this card. 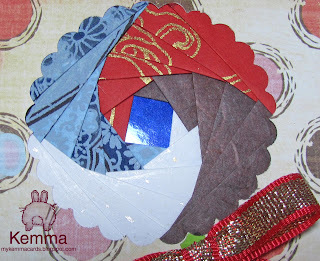 I had heard of tea bag folding in an iris folding class I took in December at my local library. I was searching through some of my books and happened to find one showing how to make this design. It involves taking little squares of paper and folding them up rather intricately and then putting them together to form a pattern. I used George and Basic Shapes cartridge to cut out 8 2x2 pieces for the center design since I did not have a square punch that size, using the white side of the paper for half, and the design paper for the other half. That is one of the neat things about having a Cricut, I can make a bunch of the same shape really quick and easy with it. stained it up real nice to match my desk, which is to the right which you cannot see. 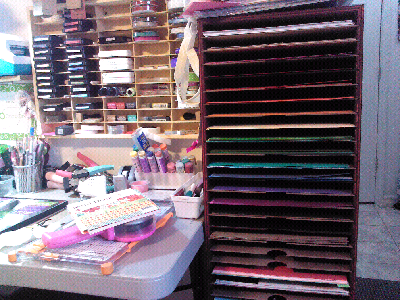 I have started organizing my paper, first the solids in sort of a rainbow order, and then I put some of my stacks in the bottom, but I have all these loose patterned papers that I just have no idea how to sort. Do I want to do it by brand, since several of the challenges I do want certain brands of things? Or do I want to also do rainbow and take the stacks out and maybe put them on top of the cabinet? Hmm, that could work, but I am just not sure, will take more thinking! 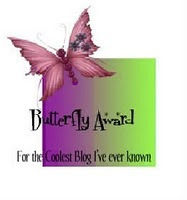 Woohoo my 100th blog post!! Today we have a project in Iris Folding! It's a baby rattle. 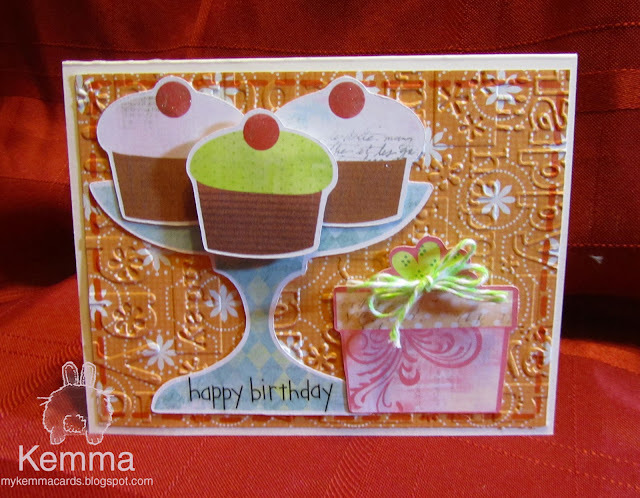 I took some of the colors from the patterned paper, which is Little Sprout by Fancy Pants Design. I had a baby stamp, colored them with markers and cut them apart to look like baby blocks. For the folding, I used papers from a sample pack I got at Dolphin Papers. I hand cut the handle for the rattle and added some ribbon and a little Ranger Barn Door distress ink on the edges. 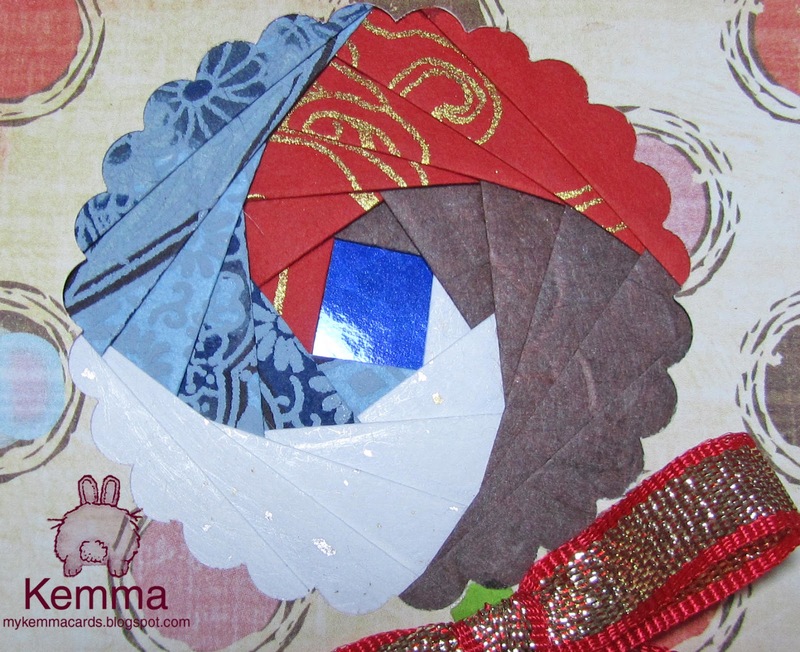 For this challenge members will be using a simple circle pattern to create... something round!